Now we are all warriors – in the war against waste. The waste warriors take to their boats and become ocean crusaders. There are also the waste transformers who create visual poetry from the discarded and abandoned to speak to us. Carolyn Cardinet is a French born, local and international artist. Prolific, driven and energetic, she “engages people with places in ethical ways”. She’s always gathering, gathering, some particular white plastic items for her next show. 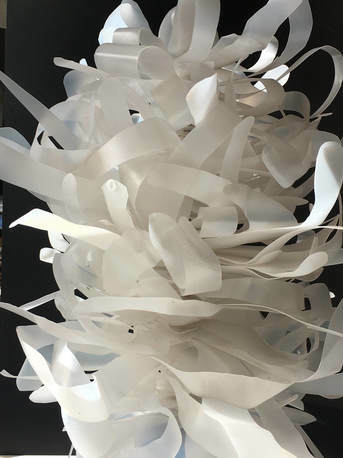 Her work includes large scale installations as well as smaller pieces such as this Sea Banksia (you know my weakness for this genus). It’s deeply ironic that acting on plastic litter is so transformative. Every person who comes to Beach Patrol’s monthly clean is changed by it. We become interested in the source of the litter, we become more committed, more engaged. Our plastic use changes. Beach Patrol gave rise to Love our Streets when once a month residents comb a small area for litter. Sociability, shared purpose and coffee lead to deep friendships. Creativity, craft and conversation flourish when Boomerang Bags and beeswax wraps are made. 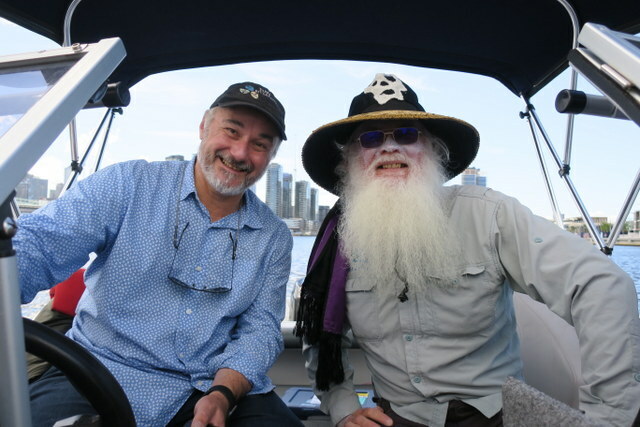 Each month Andrew Kelly, Yarra Riverkeeper and Neil Blake, Port Phillip Baykeeper, head out to trawl the Yarra and Maribyrnong for microplastics. Those are plastics less than 5 mm, broken down from other plastics. They share a thermos and River-Bay conversation along the way. They are part of an international network of waterkeepers. The results of the trawls have been analysed in a report prepared by the Port Phillip EcoCentre. The trawls reveal that over 828 million litter items flow into Port Phillip Bay annually from the surface waters of the Yarra and the Maribyrnong. Over 612 million (74%) of these items are microplastic. The report concludes that the litter load on the Yarra is increasing, especially of polystyrene. This accords with my observations at Westgate Park. The report was launched by Minister D’Ambrosio on ‘nature’s podium’1 – the banks of the Yarra recently. All those who had played a role in the research gathered in a circle under the eucalypts to share their contribution to the project. The words most called upon that day were collaboration and cooperation. This distributed problem calls on all our responsibility. April Seymore, Executive Officer of the Port Phillip EcoCentre, is an artist for transformation. Language, colour, imagery and music infuse her way of strengthening relationships, nurturing collaborations, thinking differently. She has an art-full approach to bringing people together without war talk. responsible manufacturing, handling, and recycling via circular economy models and principles. plastics or try to replace them with truly sustainable alternatives. concentrate on forging working partnerships that result in effective collaboration. Fantastic work. The bay is in great hands. We should all be helping and educating. Love your work, that’s plural for all of you Enviro Champions. I just hope that the Politicians & Law Enforcement could and WOULD do an equally good job. Don – A Friend of the Waterways of Port Philip and the Melb Metro area.